It has come to my attention that some of you have not yet bought copies of my books. Buy a copy of my book today or I will choke this coach to death. The most under-used short serve: no-spin to the middle. This cuts off the wide angles, is difficult to push heavy or push short, and if served low (very important), is tricky to flip aggressively. The opponent has to make a split-second decision on whether to return it forehand or backhand, which is sometimes awkward even against a slow, short serve. It is especially effective if mixed in with backspin serves. Ideally serve so the second bounce, if given the chance, would bounce just short of the end-line. You need to dominate with your backhand as well as your forehand, and you can't do that unless you have a (drum roll please) dominating backhand. There are basically five ways you can do this. Which are you? Or which are you striving for? You can - and should - be able to threaten your opponent with more than one of these. Backhand block, where you take every ball quick off the bounce and hit at wide angles and to the opponent's middle, rushing him into mistakes. You can do this either as a "wall" who tries to never miss, or as a more aggress "jab-blocker." This requires fast reflexes. Backhand counter-hitting, where you get into fast counter-hitting rallies and keep hitting hard and consistently until the opponent misses. This requires fast reflexes and timing. Backhand hit and smash, where you mostly take the ball at the top of the bounce and hit most shots very hard, often threatening to kill every shot. This requires great timing. Trick Serves and Third-Ball Serves. Asif Hussain emailed me about a clinic held last week at the Lily Yip Table Tennis Center in New Jersey. With Asif's and Lily's permission, here are excerpts from his email. Mikael Andersson, ITTF Director of Education and Training along with former Chinese National Team member and coach Zhen Yu San came to Lily Yip's club for a one-hour free coaching class. I of course got caught in traffic and missed the first half hour so I'm not sure what happened in the first half. When I got there, Mikael was wearing street shoes, jeans, and jacket and walking around the court with a microphone. Tina Lin (2200) and Michele (13-year-old around 2000) were doing drills with Mikael directing the drills and providing his observations. The rest of the club members stood around the court and took in his information. Ever gone out and practiced your serves, but then, as soon as you go out to play a practice match, you find yourself holding back on the serves because you're afraid of missing them? And so after spending all that time practicing serving spinier, or lower, or faster, or some new tricky serve, as soon as the game starts you go back to your old serving patterns? Try the "two-fault rule" in some of your practice matches. All this means is that you are allowed to miss two serves per game without losing a point. This allows you to really push the limit on your serves, and so you can incorporate what you practice into your practice games. After all, they are practice games, right? 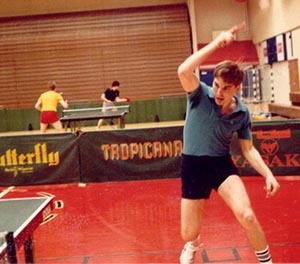 Random drills are among the most under-utilized drills in table tennis. Rote drills (where you know where the ball is going to go) are great for developing strokes and footwork, but in game-type situations, you don't know where the ball is going. So you have to train for that, and that means random drills. Here are two important keys to doing random drills properly. First, focus on reacting to the incoming ball; don't try to anticipate. You want your first move to be the correct one every single time. If you find yourself moving one way and having to correct yourself to go the other way, you are anticipating since you are moving before you know where the ball is going. If necessary, slow the drill down until you can do the right first move every time. Everyone, grab a racket. Now do your normal forehand drive or smash backswing. Now freeze with the racket at the end of the backswing. Glance at it, so you'll see the general position. Then look at where the ball might be at this point in your swing. Now close your eyes. Think about the feel of this position. Memorize it. You want to be able to repeat this same backswing for every forehand drive or smash. It's called a repeating stroke - and if you can repeat the backswing the same way over and Over and OVER, you'll develop a highly consistent shot. Next time you are practicing, do the same thing live. When you hit a good forehand, remember the feel of the backswing as well as the contact. Then repeat. Over and over and over and over and over and over and . . . you get the idea. Now do all this for your backhand as well. You'll thank me for all this later!